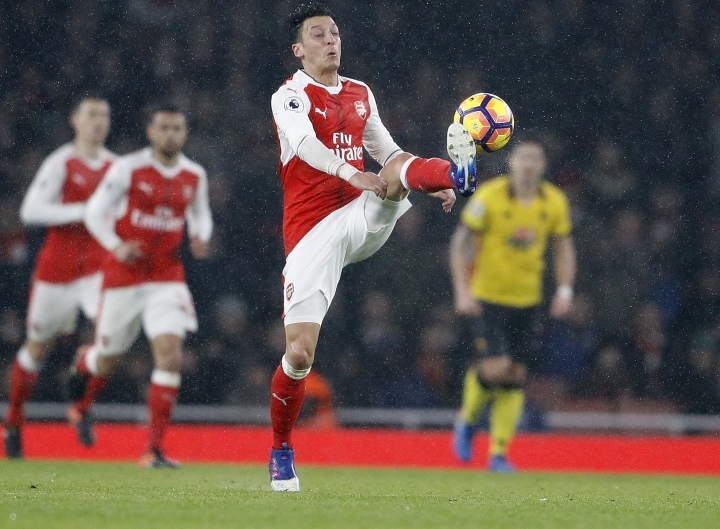 LONDON — Watford dealt a major blow to Arsenal's Premier League title hopes as it secured a surprise 2-1 victory at the Emirates Stadium on Tuesday. Early strikes from Younes Kaboul and Troy Deeney gave Watford a deserved 2-0 halftime lead before Alex Iwobi pulled a goal back for Arsenal after the break. Watford withstood heavy pressure in the final stages to hold on for its first victory in eight Premier League games and consign Arsenal to a first home defeat since the opening day of the season. Watford debutant M'Baye Niang made an instant impact as he won a free kick on the edge of the Arsenal box in the 10th minute, with Kaboul sending his shot past Petr Cech with the aid of deflection off Aaron Ramsey. With Arsenal still reeling from the opener, Ramsey carelessly lost the ball to Etienne Capoue, who surged into the Arsenal box and forced a fine save from Cech, only for the ball to fall for Watford captain Troy Deeney to double the lead after just 13 minutes. There was a touch of fortune about both of Watford's goals, but the visitors were more than worthy of their halftime advantage after dominating every aspect of the opening period. Arsenal was unrecognizable after the break. The introductions of Theo Walcott and Alex Oxlade-Chamberlain in place of Olivier Giroud and Ramsey helped, but a much-needed rise in intensity was the most crucial factor. Iwobi was the catalyst for Arsenal as he created his side's best chance of the game in the 50th, only to see Walcott's shot saved by the feet of Heurelho Gomes. Iwobi took matters into his own hands 10 minutes later as he converted the relatively subdued Alexis Sanchez's cross to the back post with a delicate volley back across goal. 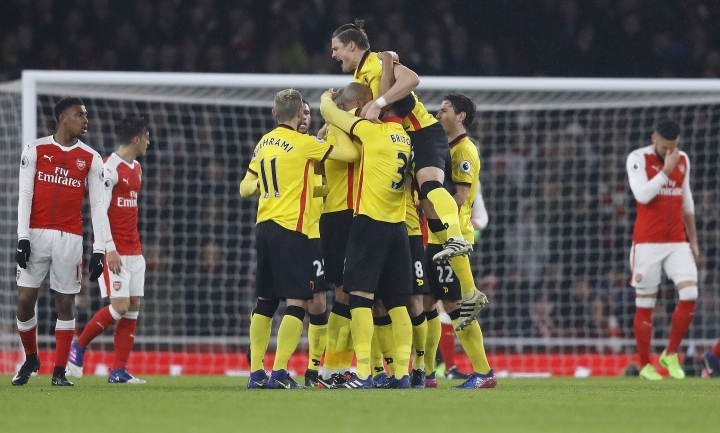 But that proved to be as good as it got for Arsenal, as Watford, inspired by a string of Gomes saves, held out for a crucial victory. The Brazilian goalkeeper did require assistance from the woodwork, as substitute Lucas Perez's powerful strike cannoned back off the crossbar in the 85th. 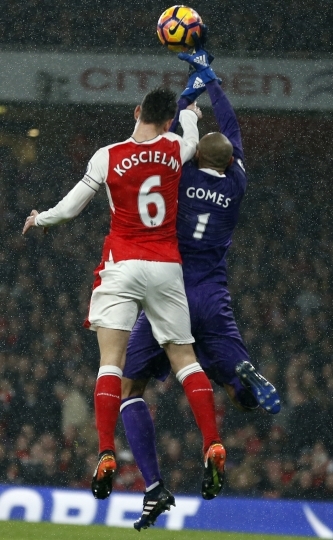 The result leaves Arsenal nine points adrift of Premier League leader Chelsea, which secured a 1-1 draw at Liverpool. Watford climbed to 13th.